Last Sunday I attended a tournament. I hadn't been to one in awhile, but what better way to spend the first day of winter than sitting around playing mahjongg, especially in a well-run tournament with familiar faces. Of course one doesn't know ahead of time how one will be feeling the day of, and last Sunday happened to be Day 7 of my pre-winter not-so-common cold. So I had a bit of laryngitis and as a result brought along some accoutrements that would allow me to play in comfort. These included a padded cushion, a cup holder, cough drops, tea with lemon and a small bottle of Purell. I didn't expect anyone to have a problem with it. Most people didn't. There were 13 tables. I started at 5 West and moved up two tables as west does, ending round 8 at table 6. Round one was a bust until the fourth game when I made the NN SSS 11 111 1111 hand. East gave me 25 points, but as I was bringing the score sheet up (West's job) I realized it was a 30 point hand. Fortunately it was corrected, no harm done. "Sometimes that five points makes the difference," I said, knowing that to be true. Then, round two, I made The Big Hand! Not bad for a sick girl. I got $20, 75 points and started feeling pretty good. So I was a little cocky when I got to round three. "Whaddya, movin' in?" said East when she got a load of my cushion and cup holder. I was a little taken aback, but proceeded to make myself comfortable when South put her hand over her mouth and said to East in an exaggerated whisper, "I bet you that one is slow," referring to me. Did she really think I couldn't hear her? Well, I got up to get a cup of tea. "Hey, we're all ready," said North. I pretended I didn't hear. I sat down to play, put the teacup on the cup holder, which promptly fell all over the floor. Whoops. Oh, well. I managed to win two games, even after calling for a 3 dot which East, having picked before North discarded, said, "too late, I racked it." I then picked three jokers in a row, threw out all my 3 dots and called for mahj when East threw a 6 crak. So there. 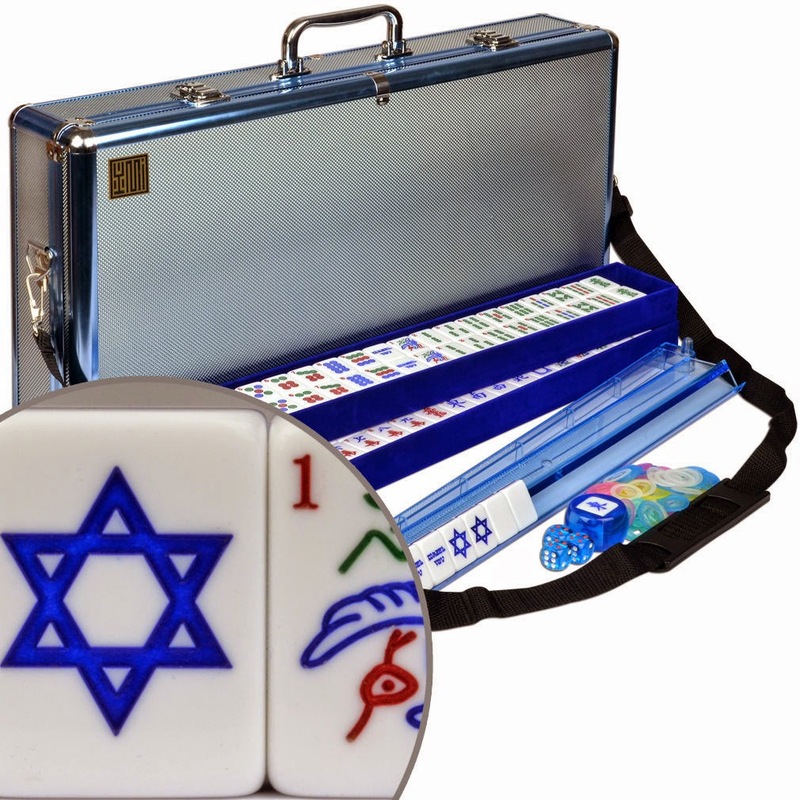 And then I played with a set that gave me the biggest headache - the "mazel-tov" set. Somehow I thought the Star of David was a joker symbol and it looked like I had 13 of them. It just sort of threw me. That and East asked me to wash the Purell off my hands so I wouldn't get it on her tiles. Here I thought I was doing something nice being germ free and coughing into my elbow. Well, the computer program was broken so a handwritten score sheet was going around. When I looked at round 7, I was in second place! Shut the front door! I had 395 points but knew I was no match for the first place player - she had over 500. I played my best, continuing my strategy of making the best hands I could and not throwing mahj. So you see aside from the "Big Hand" all my hands are 25s or 30s, once or twice picking a 25 myself and getting ten extra. I was set a couple of times for better hands; once a quint and once a pairs hand, but other people made it and all I could do was sigh. The last round I played opposite the first place player. One of the things I have learned about tournament play is players who are in the running generally do not announce it. Maybe they "don't wanna give no kneina hura, pooh-pooh-pooh," or maybe they know that things can change in a minute. But I knew a "Randi" was in first place and I heard someone call this woman "Randi," and I didn't think there was another "Randi" around and sure enough Randi was a consummate, quiet player, so that I only managed to make one mahj at her table. But it was enough - enough to tie me for second/third place with another player and split the pot with her. But wait! After everyone had packed up and left and I was putting away all my junk, I realized something. I don't know why I realized it then but it suddenly occurred to me - This tournament gives an extra 10 points for a singles and pairs hand. The "big hand" is a singles and pairs hand. I was short changed ten points and it made the difference, as I said in round one, unaware that I was foreshadowing the events of the day. Of course it was too late to do anything about it, and of course I have no one to blame but myself. Although East should have known to give me 85 points instead of 75, I nevertheless initialed my score as accurate, forgetting about the bonus. There is a lesson in here somewhere and I will leave it to you to find it. Always read the rules? Always follow the rules? C'est la vie? C'est la guerre? Or how about C'est la mahj? Every Friday night I host a game, and I'm fortunate to have a fine group of great players to choose from. I can fit three tables, although it is more comfortable with two. I try to limit it to ten people but at some times of the year that's not possible and so we squeeze in three. That can be up to 15 people. Everyone plays at the same skill level and everyone gets along. One thing that adds to the enjoyment is an orderly seat rotation. How often have you heard: "Oy, I can't wait to get out of this seat!" Or, "No jokers in this set?" Usually the counter is, "It isn't the seat, it's the tush." But relief is soon near when you know you are going to get up and move to another seat, possibly one that is joker-rich. Over the years we have devised a system, and I will share it with you now. Things vary depending on how many players there are, so we will start with a traditional four or five-player game. Four players: It can get very uncomfortable playing for hours in the same seat. The National Mah Jongg League has rules for seat rotation known as a pivot. After two rounds are played and the dice comes back to the original East for the second time, the original East gets up and switches seats with the player on her right. The dice stay with the seat, and, yes, the original East becomes East next game again. But at least you are moving. Five players: One player stays out while the other four play. In 1960 my aunt would refer to the player who was out as "the dummy." Oftentimes she would make a phone call and say, "I can talk for a few minutes. I'm the dummy." I was eight years old and would dissolve in a fit of giggles. Nowadays the dummy is usually a bettor, who makes a bet, then makes a phone call and says, "I'm out," or "I'm betting," and has a little chat, then plays some Candy Crush. When the game is over, East gets up and the dummy...er, the bettor, takes her place. Six players: This is a little tricky, but we have tried this system and it works. Four players play. One player bets. After the game, East and West get up and the two players who were out sit down. Repeat. So you play two games and then are out for one. When the same two players are out a second time, the player who didn't bet last time bets. Seven players: One table plays with four players, and one with three. (When we play three players we use NMJL rules and eliminate the Charleston.) When the four-player table has finished a game, East gets up and joins the three-player table so their next game is with four players and the original four-player table now has three players. Repeat. Eight players: When we have more than two full tables we use a method of random selection. In the beginning, seating is first come-first served. After things settle down we "pick" for seats. I have taken an old set and removed the 1, 2 and 3 craks. I put the tiles in a ceramic jar, pictured above. When it comes time for seat rotation, if there are eight players, only the 1 and 2 craks are in the jar. The tiles are shaken up (a cloth was placed in the jar to muffle the racket) and each player selects a tile. Those with 1's play at table 1. Those with 2's play at table 2. Each table plays four games. At the end of the round we pick again. Nine players: Players sit first come, first served. When the ninth player comes, she is the bettor. She bets on whichever table is ready for a bet first. When a game is finished at either table, East gets up and the bettor takes her spot. Ten players: Same as with eight players, but we add two 3 craks to the jar. The first player to get a 3 crak bets at table 1. The second player to get a 3 crak bets at table 2. After five games we pick again. Eleven players: We try to avoid having seven or eleven, but sometimes it happens that someone cancels at the last minute. In this event we play two tables of four and one of three. When East gets up from table 1 she moves to the table of three. When the game is done at the table of three, East from that table moves to table 2. East from table 2 moves to table 1. It's a little tricky, but it works. Twelve players: Three tables of four. After four games, players pick tiles and switch tables. Three 3 craks are added to the jar, signifying table 1, table 2 or table 3. Thirteen through fifteen players: Three tables of four. Four craks are added to the jar and the 4s signify the bettors. After five games we pick again. Other people may have more orthodox or legitimate means of seat assignment, such as a numbering system, alphabet system or other method of insuring that play is orderly and players get to play with as wide a range of players as possible. And of course in some groups and in tournament play there are many more than three or four tables. In some tournaments East stays in place while south goes down one, north goes up one and west goes down two; in others East moves along with the rest. 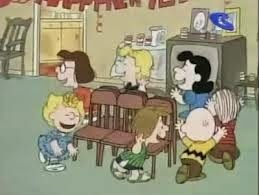 Sometimes it can feel like a game of musical chairs. 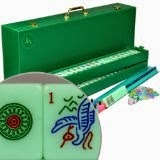 But we like our little system and tile picking, a solemn event, has become part of our mahjongg tradition.